According to the American Society for the Prevention of Cruelty to Animals, more than 7.6 companion animals enter animal shelters nationwide every year. Of those, approximately 3.9 million are dogs. Each year, approximately 2.7 million animals are euthanized (1.2 million dogs and 1.4 million cats). Unfortunately, many of these dogs are abandoned or re-homed because they have behavioral issues making it difficult for dog owners. That’s where Bark Busters comes in. Our mission is to keep dogs from being euthanized or re-homed by giving dog owners the rights tools and training to have a well behaved dog. Many dogs in rescue shelters have no major behavioral problems and are adopted quickly — the pretty, cute and friendly ones have the easiest time of it. Then there are those that are frightened anxious and shy, whose fears may have been created or exacerbated by the treatment they received at the hands of previous owners. Sometimes this can be brutal and at other times, just the fact that the owners did not understand their canine companion and its needs, can increase the dog’s anxiety. These are the ones found at the back of their kennel, who bark and growl at visitors; some dogs just don’t do well in the noisy, busy kennel situation and cannot “show” themselves off to prospective owners. The longer they are in kennels, the more difficult it becomes to re-home them. Why Are So many Dogs Re-Homed? Dogs are given up for re-homing for many reasons. They may have issues with toileting in the house, chewing everything in sight, or breaking out of their crate. Dogs may begin to show aggression to family members, visitors or other dogs and become such a worry that the owners can no longer cope with their own fear that their dog may injure someone or another dog. Some dogs, just end up in a rescue centers or shelters because they have grown too big (a Great Dane puppy!). Still others, such as pit bulls or Rottweilers, have received a bad reputation in the media and are portrayed unfairly. Some dogs are so brutally treated, and their trauma so deep set, that it can take many months of patient rehabilitation in a rescue center to help that dog overcome their fear of humans and trust once more. There are many destructive dog behaviors that can be overcome with the right behavior modification program. Bark Busters will never give up on a dog if the owner is willing to work with us to rehabilitate them. We will provide assessments, support, advice and tailored training programs to the wonderful owners who have taken on a rescue dog; we work free of charge with rescue shelters and with foster homes, to help the staff and volunteers to train the dogs so that they become well behaved for prospective owners. Some of us even foster dogs ourselves to rehabilitate the more difficult dogs, making finding them a home much easier. The saying goes “adopt don’t shop”. If possible, save a dog’s life by adopting from a rescue shelter. Many senior dogs who have already been well trained end up in shelters. A dog will bring you a lifetime of joy, comfort and protection once you have set the boundaries and your dog learns to follow the rules. Bark Busters will help you become the “leader of your pack” so that you can enjoy your dog, and your dog can enjoy being owned by you and not have to spend its life being yelled at, penned up, left outside, or surrendered to a shelter. We are grateful that over the past 5 years we have been named “Best of the Best” throughout New Haven County by dog owners. 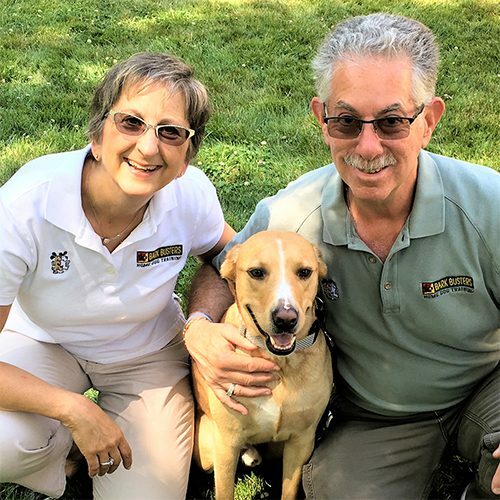 We have successfully trained thousands of dogs throughout Southern Connecticut.